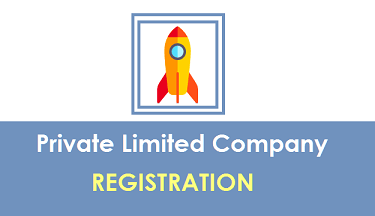 In this article we will discuss about the Private Limited Company Registration, its advantages, process for registration of Pvt Ltd Company, documents required for registration etc. Private Limited Company is one the best form of business recognized in India. It a most trusted and democratic form of business entity. Registration of a Private Limited Company is govern and regulated by the Indian Companies Act, 2013. 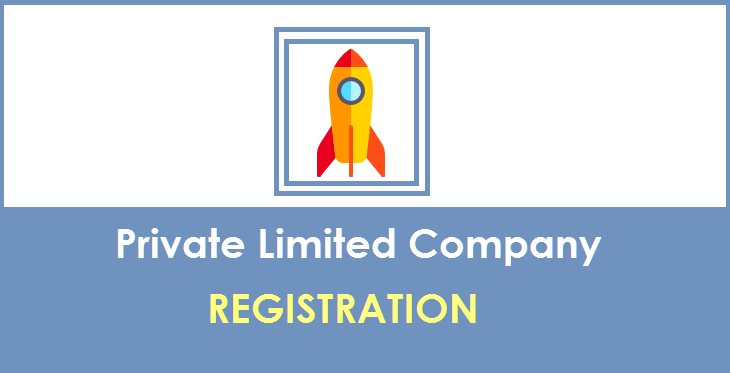 It is very easy to register & operate a private limited Company. 1. PAN (Mandatory in case of Indian Nationals): Directors needs to submit his or her Self attested copy of PAN card. 2. Identity Proof: All the Director need to submit self-attested copy of his or her Identity proof. Voter ID or Aadhaar or Driving License or Passport, any one of these can be submitted as Identity Proof. 3. Residential Proof: Director can submit any one of the following as his or her Proof of residence. Latest Utility Bill – Electricity Bill or Telephone Bill or Mobile Bill (any one). Incorporation of Private Limited Company in India is regulated by the Companies Act, 2013 (and the amendments thereof). Though, the process of incorporation is quite complex and lengthy, but we at BIZINDIGO has made the process simpler and faster by using cutting edge technology. We offer online hassle free process for registration of private limited company. Here is the process flow in brief for your ready reference. Once you submit your inquiry for Private Limited company registration using our inquiry form. We immediately revert you through email with quote & other details of Private Limited Company. Maximum one hour, our expert team member contact you and discuss the requirement in details. BIZINDIGO team member guide & advice you accordingly. Once you agreed and satisfied, we start documentation process. After basic documentation, BIZINDIGO team member start the process for Digital Signature application. Digital Signature is the secure and authentic way that a document can be submitted electronically. Now, almost all filings of e-forms on MCA (Ministry of corporate affairs) portal are required to be digitally signed by applicant or authorized signatory. 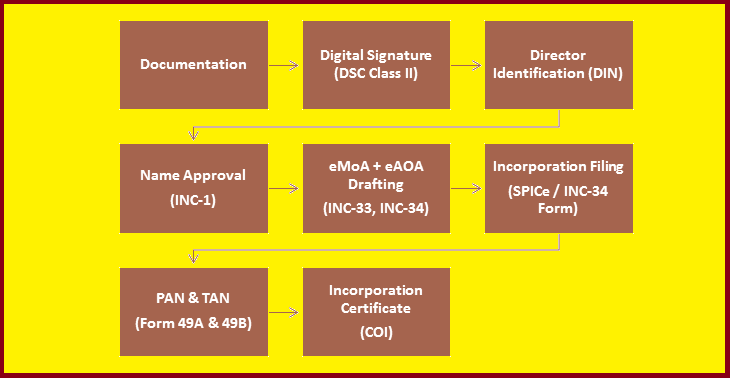 For Obtaining Digital Signature (DSC) application to be made, to licensed Certifying Authority (CA) such as e-Emudhra, nCode along with a self-attested copy of Identity Proof & Address Proof of applicant. After obtaining Digital Signature of all proposed directors, we apply for Director Identification number (DIN). DIN is pre requirement of e-filing for Company Name approval & incorporation. Without a valid DIN, no person can become a director in any company in India. DIN application be filed on MCA Portal in Form No. DIR-3. Every DIN Application (DIR -3) should be accompanied by self-attested copy of PAN, Proof of Identity and a Proof of Address and one recent passport size color photograph of the Applicant. Note: PAN is mandatory for Indian Nationals & Passport for foreign nationals. All Supporting documents must be attested by a practicing professional viz. practicing Company Secretary, practicing Chartered Accountant or Practicing Cost & Management Accountant. After obtaining DIN of all the proposed directors, BIZINDIGO team member proceed further for Name approval of your proposed company. Name approval to be obtained from the Registrar of Companies (ROC) by submitting duly filled & signed application in Form No.INC-1. We can give maximum six names in order of preference. The name once approved by the authority is valid for sixty (60) days. After getting name approval, BIZINDIGO team member draft constitutional documents of your proposed Company i.e. Memorandum of Association (MOA) and Article of Association (AOA). MOA & AOA is required to be digitally signed by each subscriber to the memorandum who will mention his Name, Address, description and occupation, if any, in the presence of at least one witness. Witness will attest the signature and shall likewise digitally sign and add his Name, Address, description and occupation, if any. Practicing professional (CA, CS or CMA) can be the witness. Duly subscribed, digitally signed eMOA & eAOA is required to be filed with RoC along with SPICe form (INC-32). After approval of Name of proposed company, applicant is required to file SPICe Form INC-32 in order to obtain the Certificate of Incorporation (COI). Now, as per newly introduced form SPICe, PAN and TAN is being applied along with SPICe form (INC-32) only. After filing of SPICe form (INC-32) for Incorporation, Form49A for PAN Application and Form49B for TAN application is generated. Digitally signed forms (49A & 49B) then uploaded on MCA portal in order to obtain the PAN and TAN number of the proposed company. If, Roc find everything ok or in place, the Certificate of Incorporation is issued along with a unique CIN (Corporate Identification Number) and allotted PAN Number. Now, COI is being issued along with PAN number mentioned on it. So, there is no need to wait to receive physical PAN card to open a Bank account. The Company is deemed to be incorporated from the date of the Certificate of Incorporation. You can Register a Private Limited Company and start your business in India easily. BIZINDIGO is here to help you. You can take the advantage of our free expert consultancy on Startup or how to register a company in India. We have a dedicate team to cater the requirements of clients who is seeking legal assistance to setup a company, or business in India.